Stick with your hand and see if the dealer goes bust (in most Blackjack variants the dealer cannot stick on less than 17). Once you have placed your stake you are dealt 2 cards and the dealer is dealt 1 face up card. Blackjack - If you are dealt 21 on your initial hand, it is refered to as a natural Blackjack and you are paid 2.5x your stake. Unless the dealer also shows Blackjack (note a natural Blackjack is the highest hand, worth more than 21, made from 3 or more cards). Stand is when you refuse anymore cards, do this when you feel you have a high hand say 17 or more. Or when the dealer shows a low card, (as the dealer must 'hit' on 16 and lower hands), hence there is a fair chance of the dealer going 'BUST' if the dealer were to draw a high card. Accept an additional card to get your hand value closer to 21, you may do this as many times as you wish as long as your hand remains under 21. However if the additional card you receive takes your hand above 21 you go BUST and lose immediately. If your inital hand is between 9-11 you may also be able to Double or if you have been dealt 2 matching cards you can Split. If the dealer's face up cards is an Ace you will be offered Insurance. Once the player has finished the dealer reveals/draws their 2nd card. The dealer must stand on a hand 17 and HIT on hands totalling 16 and less. If the dealer exceeds 21 after a HIT, they go BUST and automatically lose and the player wins. Once the dealer has finished, whoever has the hand closest to 21 wins unless it ends in a draw. 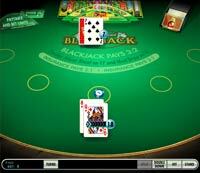 In Blackjack when your inital hand is of a certain value you are offered the option to double. If you choose this option your stake is doubled and you are dealt one additonal card then your turn ends (you are not allowed to hit afterwards). Typically you are allowed to double when your inital hand value is between 9-11, although this depends on the Blackjack variant (some variants will alow you to double on any hand). When you are dealt a pair of the same cards you are offered the option of splitting. If you choose this option your cards are split into two new hands and an additional card is dealt for each of the two new hands. Your stake is also doubled, one for each hand and these are played independantly. Hence if you lose/bust on one hand you may yet win on the other. Typically you are not allowed to split again or double on a split hand, but again this depends on the Blackjack rules your game is played by. When the dealer is dealt a face up Ace card, the player is offered the option of taking insurance. Insurance protects the player in the event of the dealer drawing Blackjack. If you do take insurance you place a bet half the value of your current stake. Assuming the dealer does draw Blackjack (and assuming you don't have Blackjack) you lose your stake on your cards but you win the insurance bet which pays out at 2x the stake - basically you walk away with neither a win or a loss. If the the dealer does not draw Blackjack, your insureance bet is lost and the game proceeds normally. Never take insurance! (it increases the house advantage by 5.8-7.5%). Some casinos will offer the player the option to surrender on their initial hand by forfeiting half their stake if the player does not like their prospects. 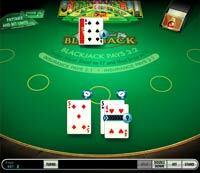 Casino operators generally publish their specific blackjack rules online. Check our section on Blackjack variations to learn Blackjack rules on the key variants. SOFT - An ace & card with a value lower then 10 is refered to as a 'SOFT' hand, because the value is flexible, i.e. a ace & 7 can equal 18 or 8. HARD - A hand without aces are refered to as 'HARD' hands, because their values are definate. William Hill offers Blackjack Switch (0.05% house edge). Unlike most casinos, wagers on most Blackjack variants do contribute 20% towards your wagering requirements (5% in the case of Blackjack Switch).